Special Olympics Illinois athlete Dan James has been competing in Far West Suburban/Area 2 for more than 20 years. But sports are not the only thing he excels in – Dan also finds passion in music. 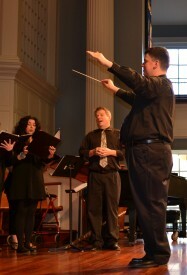 This year, Dan conducted the National Anthem which opened the 6th Annual You Raise Me Up Concert at College Church in Wheaton on April 11. This concert brought in nearly $4,500 for Special Olympics Illinois Far West Suburban/Area 2. The 28th Annual Midwest Golf Celebrity Pro-Am to benefit Far West Suburban/Area 2 will be June 22 at The Royal Fox Country Club in St. Charles. The format for this year’s event will match professional athletes, and other celebrities with amateur foursomes in a scramble format tournament. Registration begins at 9 a.m., with a shotgun start at 10:30 a.m. There will be cocktails and a dinner/auction after the day’s golfing. This event offers attendees the opportunity to join the network of corporations and individuals who contribute to the success of thousands of Special Olympics athletes in the Chicagoland area. Please join us this year as a sponsor, individual golfer or if you can’t attend, a financial contribution. For more information contact Amy Kaylor at 630-377-7250. View event registration flyer. Join the fun at the 7th Annual Chicago Cubs Rooftop Party at 7:05 p.m. Wednesday, April 29. Enjoy a fun evening and exclusive rooftop views of all the action at Wrigley Field from Beyond the Ivy Rooftop at 1010 Waveland Avenue. The game promises to be exciting as the Chicago Cubs challenge the Pittsburgh Pirates. Tickets include unlimited food, beer, wine and soda and guests will enjoy seating that is both enclosed and outdoor on the roof. Guests will enjoy a silent auction featuring Cubs tickets, restaurant and entertainment gift cards. Tickets including single prices as well as group discounts can be purchased online. There are limited tickets, so order yours today! Contact Kathy McLaughlin at 773-278-2178 for more information.View flyer for event. Friday, April 3, was an exciting evening for the fans in the stands at the Chicago Bulls game. 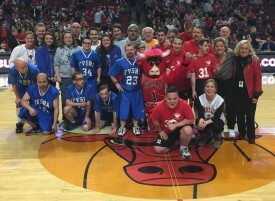 Two Special Olympics Illinois basketball teams were invited to participate in a scrimmage during halftime at the United Center. Fans cheered on great play between the Misericordia Hot Shots team of Chicago and the Fox Valley Special Recreation Association Blue Stars of Aurora. 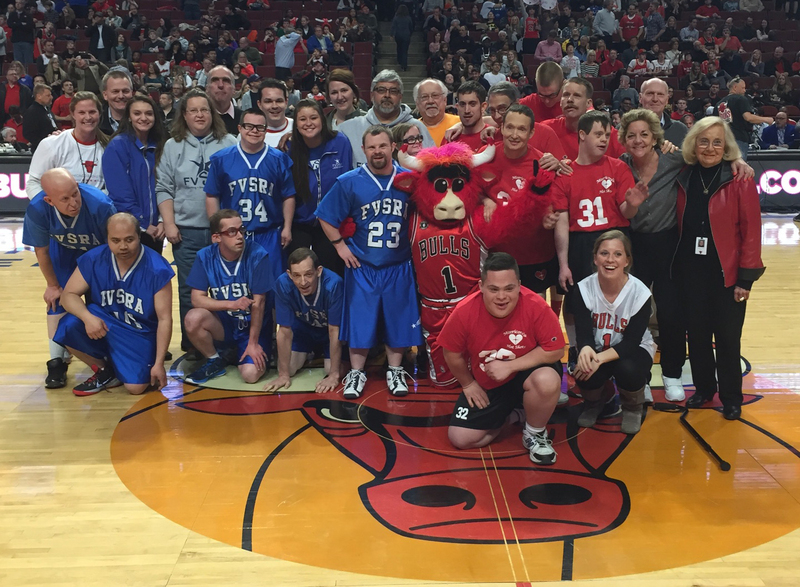 The opportunity to scrimmage on the same court as the Chicago Bulls is a highlight for Special Olympics players and coaches and judging by the audience response, the audience had a great time also. The halftime opportunity has been offered to Special Olympics Illinois teams for more than 10 years. More than 125 people showed up on Saturday, April 11, for the 10th Annual Young Professionals Board Pub Crawl. Pub Crawl guests visited seven restaurants in the Old Town neighborhood of Chicago and enjoyed drink and food specials throughout the day. The planning committee also arranged a raffle featuring tickets to Chicago White Sox and Chicago Cubs games as well as gift cards to more than a dozen Chicago restaurants. he event earned more than $2,800 to support athletes who participate in the Chicago/Area 3 Special Olympics program. The Young Professionals Board (YPB) was formed in 2005 to raise funds for Special Olympics Illinois Chicago/Area 3. For more information, contact Kathy McLaughlin. For the Green Family Auto Group, giving back to the community is a high priority for the company. 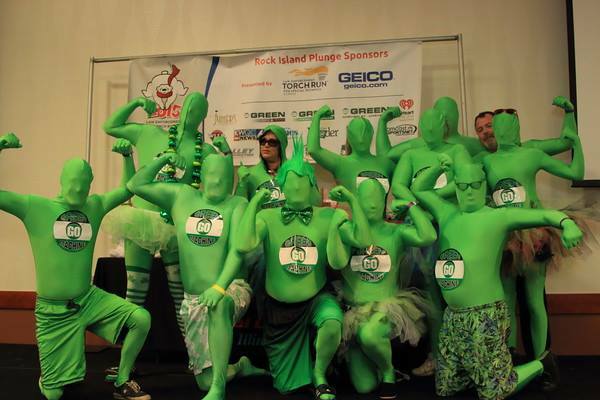 Their generosity was quite evident this winter with their support of Special Olympics Illinois and the Rock Island Polar Plunge at Wicks Lake at Jumer’s Casino & Resort. Jill Green, owner of Green Family Hyundai of Moline, Green Buick GMC of Davenport, Iowa and Green Chevrolet Chrysler of East Moline, pledged an initial $3,000 to sponsor the 4th annual event. 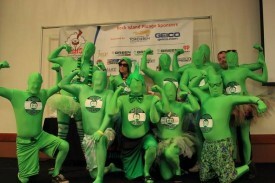 Each dealership also agreed to form a team to participate in the Plunge. On Tuesday, June 9, a Unified group of 14 Central Illinois residents under the team name of Heartland/Area 6 will head to Southern Illinois to run a half-mile in the Unified Relay Across America. It is a well-known fact that all athletes, disabled or not, have to overcome hardships, setbacks, injuries or defeats in order to continue competing and growing in his or her sport. But sometimes an athlete’s tale of determination and courage to achieve her goals is so inspiring, the journey must be shared. Such is the case of Special Olympics Illinois East Central/Area 9 athlete Brooke Ingram of Mattoon. Brooke Ingram receives an award at Area 9 Spring Games last year. Brooke, 21, began participating in Special Olympics sports while attending the Armstrong Center. 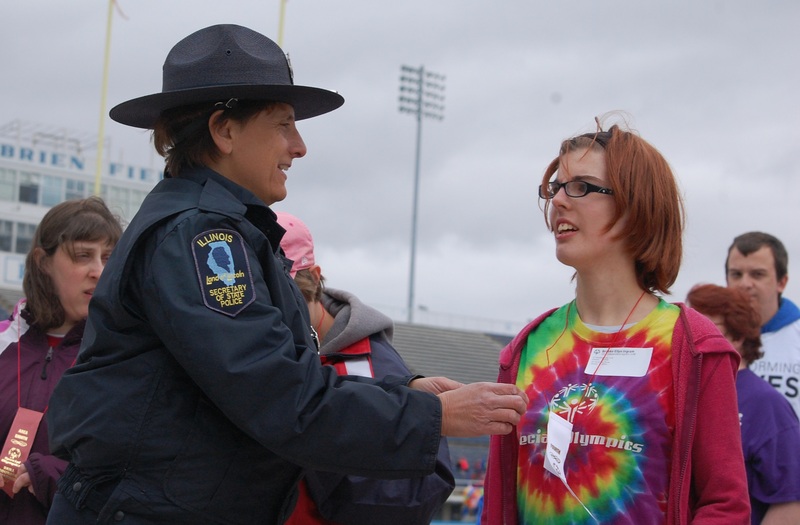 However, after falling in love with the track & field events and competing for a few years at Spring Games, Brooke was informed that her school would no longer be participating in Special Olympics competitions. Brooke was undeterred by this news. She spoke to her family about her strong feelings of wanting to continue participating in the local events and activities offered by Area 9. Seeing how important it was to her, Brooke’s mother, stepfather and younger sister all rose to the challenge by becoming coaches so Brooke could achieve her goals. They are all now part of the Independent Ingram Special Olympics team. Special Olympics Illinois and Missouri have partnered with St. Louis Cardinals Care and the St. Louis Cardinals for the 3rd Annual Special Olympics Night at Busch Stadium on Wednesday, May 27. Cardinals Care has invited 400 Special Olympics athletes from IL & MO to come and watch the St. Louis Cardinals take on the Arizona Diamondbacks at no costs! In addition, the Cardinals are offering a special ticket prices for all Special Olympics fans, friends and supporters. Tickets are located in the 200 level of the Left and Right Field Pavilion and are only $15 with $5 of each ticket being donated to Special Olympics. This offer is only available online and tickets must be purchased by Wednesday, May 13. Purchase your tickets here. Join the Law Enforcement Torch Run before the game at Cardinals Nation located inside Ballpark Village. Officers from Illinois and Missouri will be collecting “Spare Change” from the crowds to benefit the athletes of Special Olympics. For more information on either event, contact Sandy Nash at 618-654-6680. View flyer for both events.